Young or old, few ever outgrow the love of laying on the floor while visiting or watching television. What you need are some big comfy floor pillows that you can use for those times when the gang is over at your house and there is no room on the couch. If the pillows are big enough (24 to 36 inches) they can also be seat cushions around a big coffee table for the overflow from the dining room. If you can’t quite envision these in your house, how about making a stacking set of these giant pillows to give to a student or a young couple in a new apartment. They never have enough seating. Cover the cushions with an upholstery fabric and pipe the edges for a real professional look. Small Square Cushion: 18″ sq. Medium Square Cushion: 24″ sq. Large Square Cushion: 30″ sq. 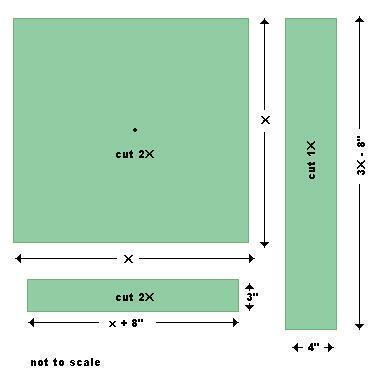 To prepare the welt, cut 2 pieces of fabric each measuring, the length of the cushion (X) plus 8″ by the required depth less 1″, adding ½” to all edges for seams. 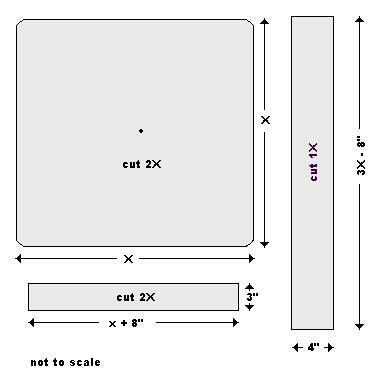 Cut 1 piece of fabric measuring, the width of the cushion (X) times 3 less 8″ by the required depth, adding ½” to all edges for seams. Make sure to cut the depth from down the length of the fabric. Cut the top and bottom cushion pieces to the required size, (X by X), adding ½” to all sides for the seam allowances. If patterned fabric is used, make sure to centre any design on the fabric. Cut bias strips of contrasting fabric 1 ½” wide to make the piping. Make enough length to go around the perimeter of each cushion plus 5″, twice. Spray each foam pad with spray adhesive and wrap in batting on all sides. Cover 2 button blanks with contrasting fabric for each cushion. Join enough bias strips for the required length and wide enough to cover the cable cord plus the seam allowance. Lay the cord in the centre, on the wrong side of the bias strip. On the 2 smaller welt side pieces, turn under ¼” and then 5/8″ along one long edge, making sure that any design or nap on the fabric is the right way up on all the pieces. Press. Open the fold and center the hook side of the fastener tape on one piece and the loop side of the other, leaving 4-1/2″ free on each end. Stitch fastener tape in place. Re-fold edge and sew length of turned edge. Lap hook and loop together to create a width of 5″ when combining the 2 welt side pieces. Sew across the ends to secure. Join the welt pieces together to form a ring, making sure that any design or nap on the fabric is the right way up on all the pieces. Pin the ends of the strips, right sides together, and stitch, ½” in from the raw edges, using a flat seam. Press the seams open. Place the contrasting piping around the outer edge of the bottom cushion piece, right sides together and matching the raw edges. Align the seams on the welt to the corners of the cushion piece so that the piping gently curves around at the corners (clip cording seam allowance if necessary). Starting and finishing at the back of the cushion and joining the ends of the piping cord to neaten. Baste in place, 1/2″ in from the raw edges. Sew in place using a zipper foot. Stitch the welt to the bottom cushion piece. Attach the piping cord to the perimeter of the top cushion piece. Starting and finishing at the back of the cushion and joining the ends of the piping cord to neaten. 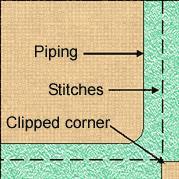 Pin the top section to the top edge of the welt, ½” in from the raw edges and matching the corners. Stitch in place using a zipper foot on the sewing machine so that the stitches are close to the piping cord. Turn right side out through the opening. Insert the covered foam pad into the cushion and close the lapover on the opening. If using, attach a covered button to one end of heavy-duty thread and anchor through center of cushion. Draw thread throuh foam pad and out other side of cushion. Attach a second covered button and return thread through center. Tighten up slightly to tuft pillow and pass thread through first button. Knot thread. thanks for these. I could make my own instead of buying one. I am always looking for ways to make my classroom library more inviting. I will be trying this for sure.